Is Abstinence the Only Solution for Alcoholism? AlcoholismIs Abstinence the Only Solution for Alcoholism? Many people with an alcohol problem wonder, is abstinence the only solution for alcoholism? Here, we look at the issue of abstinence. Alcoholism is an addiction to alcohol, which is characterized by compulsive alcohol use despite the negative consequences the drinking causes. 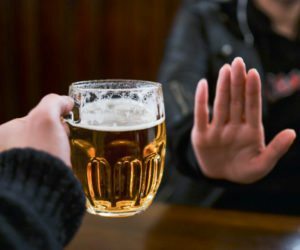 People who are addicted to alcohol continue to drink despite problems related to relationships, finances, physical and mental health, and the law. They will crave alcohol, and they’ll drink more than they intended, or for longer periods of time than they intended. Many people who know they need help for alcoholism wonder, is abstinence the only solution for alcoholism? To understand the answer, it’s essential to understand addiction. Addiction is the result of changes the brain undergoes when it’s exposed to large amounts of a psychoactive substance. Heavy drinking alters the physical structures of the brain and changes its chemical functions. These changes take place in the memory, learning, and motivation centers of the brain, which begin to communicate in ways that lead the brain to believe it needs a substance in order to survive. This results in intense cravings and compulsive drug-seeking behaviors. Once you’re addicted, you’ve lost control over your drinking and will continue to drink even if you know you’ve had enough. Even if you want to quit or try to quit, you’ll find that you can’t seem to do it for the long-term. Addiction is a progressive, chronic, and relapsing disease. Progressive means that without professional treatment, an addiction will almost always get worse. Chronic means that addiction can’t be cured, but it can be sent into remission for the long-term. And relapsing means that if you drink again after a period of alcohol abstinence, the addiction can return, once again characterized by compulsive drinking despite negative consequences. This means that the answer to the question, is abstinence the only solution for alcoholism? is almost always yes. Whether or not someone develops an addiction depends on a large number of factors. Genetics accounts for roughly half of your risk for developing an addiction. The remaining factors are environmental. Addiction almost always has underlying causes. The most common of these are chronic stress, a history of trauma, and a co-occurring mental illness. Many people who drink to excess do so as a way of self-medicating stress, mental anguish, or symptoms of illnesses like anxiety or depression. As the brain changes due to heavy alcohol abuse, an addiction may develop, and this will lead to dysfunctional thought and behavior patterns. Ending the addiction requires high quality alcoholism treatment. So, why is abstinence the only solution for alcoholism? It’s because in order to end the impulse to drink, you have to address the root issues that underlie the addiction. Successful recovery also requires identifying self-destructive thought and behavior patterns and learning healthier ways of thinking and behaving. Recovery depends on developing a healthy lifestyle that involves a high level of self-care, and it depends on learning to have fun and relax without needing alcohol to do it. The Substance Abuse and Mental Health Services Administration describes recovery as a “process of change.” Recovery is never complete–you’re never cured of your alcoholism. If you go back to drinking after a period of alcohol abstinence–even a long period–the changes are extremely high that you’ll end up addicted again at some point. Most people who ask, Is abstinence the only solution for alcoholism? are hoping the answer will be no. It’s scary to think about a life without alcohol. You wonder who you’ll be, and you wonder if you’ll be miserable as a sober person. The whole point of treatment is to help you find out who you really are, to help you find purpose and meaning in a life without alcohol, and to help you restore happiness and function to your life. Most people who engage with their treatment program find a new lease on life and a new joy in living without alcohol. If you need help getting to the bottom of your problematic drinking and finding a healthy, productive, and enjoyable life, contact WhiteSands Treatment today. We can help you recover once and for all–and enjoy it.